Great heeling stick, and it gets the job done. Everything arrived as expected, and I am satisfied with this product. The Heeling stick seems to get the dogs attention instantly and is becoming an effective in controlling the dogs while they go on their walks. That was all we wanted from the Heeling sticks. Just holding the stick in front of the dog or a light tap on the chest, to get their attention, or hind quarters to sit. The dogs are getting used to the tool in their training. By: Kevin Forsyth From B.C. Works great, lightweight, and great feel. Great healing stick for the money. Great product that is very versatile in training! Well made and durable. Easy to carry. The heel stick works really well. You're able to give a touch or a steady light pressure and the dog responds to command. It's been a great help too me. Exactly what I was looking for. Light and well built. I do wish I could get a small treat to stay on the end so I could lure him a bit, but this is a heeling stick and completely does its job. I love the bright color. It is perfectly designed for the job it was intended to do. My dog is a field Golden, so I'm training her with the breeder and using field techniques. The heeling stick is a great tool to supplement the voice commands. "Great product for training your dog to heel." Good quality purchase... Vastly improved my obedience lessons. Great quality, given the price! "you can't go wrong with the price"
I have a friend that has had great luck with these lasting a long time, and you can't go wrong with the price. Just as pictured. Works great. Excellent heeling stick, capable of use with multiple sizes of dogs. Great heeling stick. The color makes it easy to spot. It's got a good handle, and its weight is just right. I personally prefer more flexibility. However, it is always about the trainer's approach to make a bit of adjustment when using a stick of any kind to refine the heeling discipline of any dog!!! Overall, it is a great tool to have in your tool bag. Great comfortable handle. Well priced. The stick seems to slip up through the end of the grip. There are times where I try to find a magic spot on the end of the grip for the stick to stay fix. But it always seems to slip back and forth and becomes loose again. It's better than the Avery. "I like the stick. It helps to steady the dog." I like the stick. It helps to steady the dog. Just a little light pressure on his rump keeps him from creeping ahead. Wirehair Pointing Griffon. Hunts. Family pet. feels well made. I have not gotten enough use out of it yet but from the limited work I have done I think I would rate it better if it was slightly more flexible and a little longer (although I am 6'3 so I am on the taller side). The SportDog Deluxe Heeling stick Bright Orange is a good tool for teaching my dog to heel. I've only just begun using it, so it will take more time to do a proper evaluation. Too early to tell how well it will last. I have three of these. They are a nice length, and the bright orange makes them easy to find when you set them down in the field. Had to tape the handle to keep it from sliding off but other than that it works just fine. Handle is a little loose on shaft, and you can feel it move when used. Personally I like them with a bit more padding but that's me. The handle came off the second time I used it. The covering came off the rod after the third use. Made for all sizes of trainers and handlers. 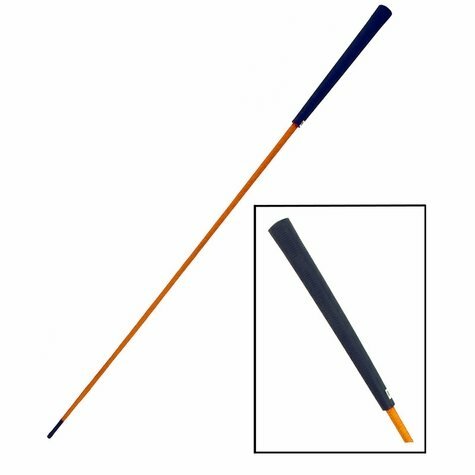 This deluxe heeling stick is made for all sizes of trainers and handlers. With an extra long non-slip rubber handle and the red body, it will be easy to hold on those wet days of training and easy to find in the field. 34" overall length.